Wing span: 1 7/16 - 2 inches (3.6 - 5.1 cm). Identification: Upperside is orange with black markings. Underside of hindwing has a red-orange stripe at the margin and a red-orange, white, and black checkered pattern on remainder of wing. Life history: Females lay eggs in clusters under host plant leaves. Caterpillars feed on leaves communally in a web. Partially-grown caterpillars hibernate at the base of the host plant. Caterpillar hosts: Flat-topped white aster (Aster umbellatus). 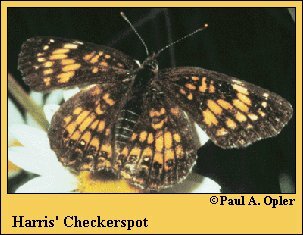 Habitat: Moist areas such as marshes, bog edges, pastures, and meadows. Range: Maritime Provinces west to Manitoba, south to West Virginia, southern Ohio, and northeastern Illinois.